- The sunken in-ground heated swimming pool is surrounded by a large terrace, with plenty of relaxing sun-loungers. 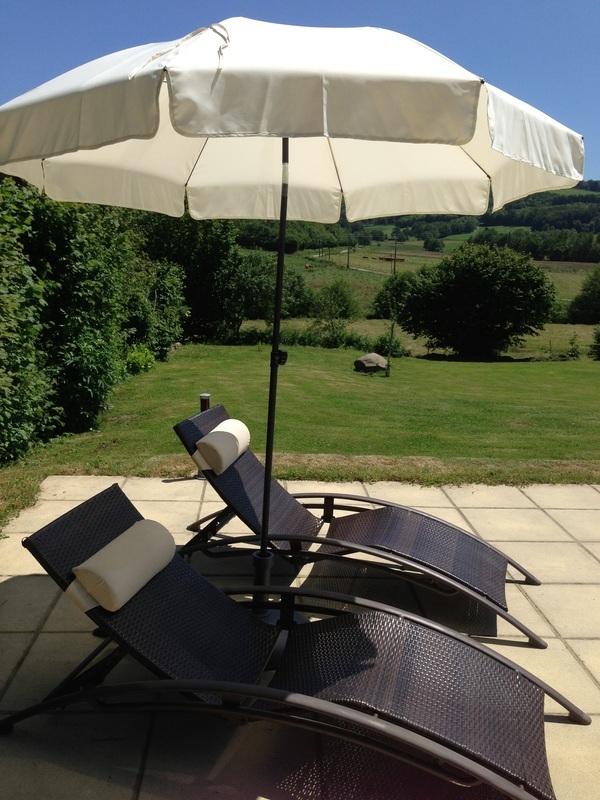 Whilst sunbathing you can enjoy the amazing views of the rolling countryside. 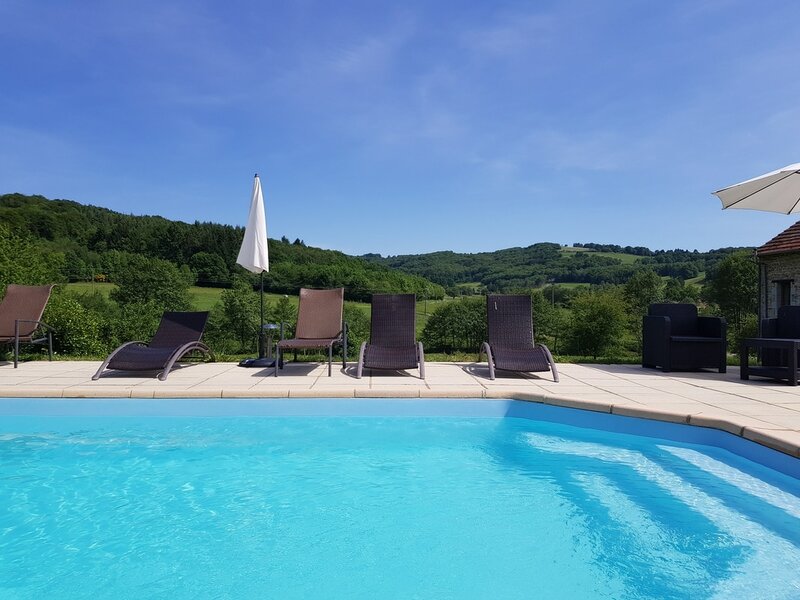 The heated pool is open from mid May to October (weather depending) and is fully compliant with French regulations, and is cleaned and maintained on a daily basis. 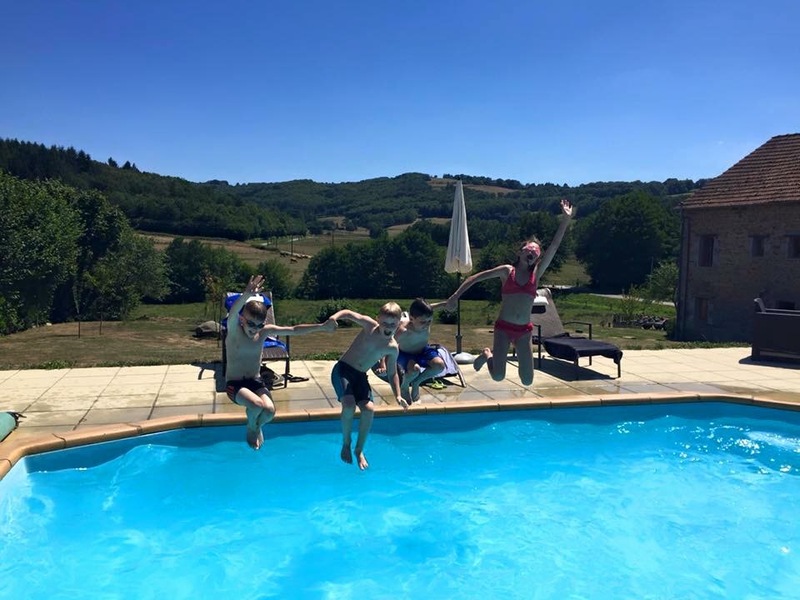 The pool has a average temperature of 25°C, which can increase with the sun! - Each Gîte has it's own BBQ, Patio Table & Chairs and Parasol on the terrace. - Family friendly large lawned garden,with plenty of room for the children & adults to play. - Children's Playarea, with Playhouse, Swings, See-Saw, Slide & much more! 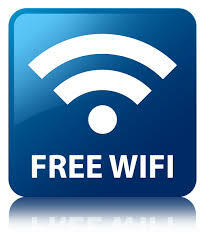 - Broadband Wi-fi Internet is available throughout both properties and around the pool terrace. - Bed Linen, Duvets, Pillows and Bathroom Towels are provided in the price, but please bring your own beach towels. We do hire Beach Towels (please enquire). - Mattress protectors are on every bed. - Hand towels (bathroom & kitchen), tea towels, dishcloths & cleaning materials are also provided. - Baby Equipment (Cot & High Chair) can be provided and included in the price - please mention on booking. - A complimentary welcome pack on arrival, including Tea, Coffee, Sugar, Milk, Salt & Pepper (not for short term bookings). - Washing Machine and outdoor airer. A tumble drier is available. - Electric Heaters & Winter Bedding in colder months. - Fans are provided in hot summer months. 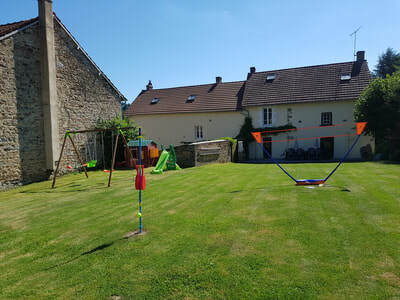 - Other grocery items can be purchased for you arrival, this prove extremely useful when arriving in rural France, please ask for further details. - We operate a No Smoking Policy, Smoking & Vaping is not permitted within the properties. Ash trays are provided outside on the patio tables. - No pets are allowed in the properties. 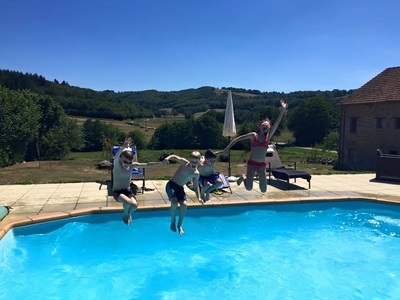 - We live on site so are on hand to help in any way we can to make your holiday a memorable one – from booking restaurants, horse riding & golf, to helping you plan your days out, recommending beaches, places to visit, walks etc. 5 Route de Bosmoreau les Mines, Janaillat, 23250, France.